When the body of an American archaeologist is found floating in the Yangzi River, Ministry of Public Security agent Liu Hulan and her husband, American attorney David Stark, are dispatched to Site 518 to investigate. As Hulan scrutinizes this death, or is it a murder, David, on behalf of the National Relics Bureau, tries to discover who has stolen from the site an artifact that may prove to the world Chinas claim that it is the oldest uninterrupted civilization on earth. This artifact is not only an object of great monetary value but one that is emblematic of the very soul of China. Everyone from the Chinese government, to a religious cult, to an unscrupulous American art collector wants this relic, and some, it seems, may be willing to kill to get it. At stake in this investigation is control of China's history and national pride, and even stability between China and the United States. The troubled Hulan must overcome her own fears of failure, while David tries desperately to break through the shell that has built up around his wife. As Hulan and David are enmeshed in international schemes for power and the turbulence of their own relationship, these hunters after the truth become the hunted, in a fast-driving narrative set against the backdrop of the building of the Three Gorges Dam, the largest and most expensive project China has undertaken since the Great Wall and the subject of great international debate. It is here, in the heart of the Three Gorges, that David and Hulan will battle their enemies and their own natures to see who will win China's dragon bones. Dragon Bones combines ancient myth with contemporary anxieties concerning religious fanaticism and terrorism to tell a story of love, betrayal, history, ecology, greed, and gory murder. "This is not your ordinary art-theft thrillerthe characters are complexthe book also manages to involve the reader in the great questions of early Chinese historywe get a fascinating insight into the methods and secrets of international art auctions. Dragon Bones is most memorable for its exploration of Chinese history at the distant point where it fades into myth. So what begins as a murder mystery ends up with a short course in China, its vastness both in space and in time. 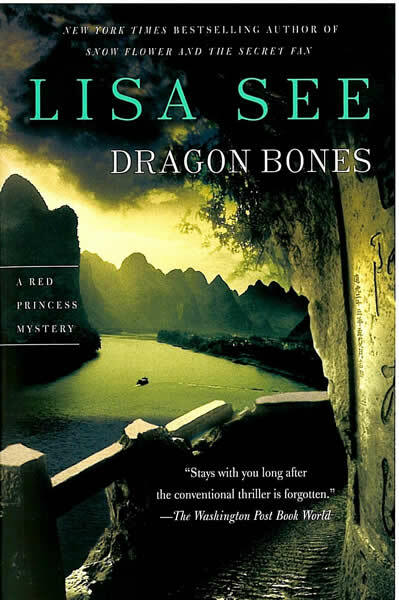 Dragon Bones stays with you long after the conventional thriller is forgotten." "The author makes good suspense out of her nuanced integration of the Chinese and American cultures, and of the massive, Pharaonic (and real-life) Three Gorges Dam."